Data gathered from analysing billions of impressions served from 1 July to 30 September 30 2017 shows that tablet ad impressions drove 1.13% click-through rates. That figure is the highest of any device in many different verticals including automotive, consumer goods, financial, food, drink, home, retail, technology, travel and utilities. 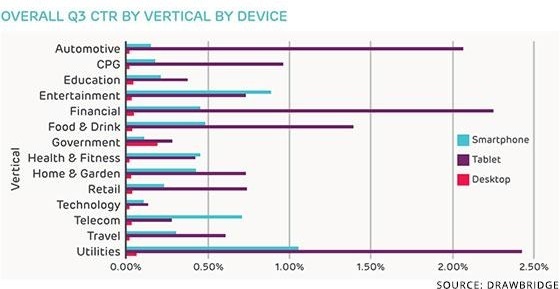 The data, complied by Drawbridge in their Q3 2017 Cross-Device Advertising Benchmark Report, should make marketeers rethink their strategy when device targeting because tablets out performed smartphones and desktop when comparing CTRs. Desktop ads saw an overall CTR of 0.03% and smartphone ads drove 0.49% CTR. Smartphones did well in the entertainment and health/fitness verticals, but it seems that consumers do prefer a larger screen. Looking at the CTR for the retail category on smartphones it was around 0.25% in third-quarter 2017 with tablets coming in at 0.75%. Utilities drove the highest CTR on tablets at 2.42%. Drawbridge found that video ad completion rates were also high on tablets compared to other devices during the third quarter of 2017 at 70%. The completion rates were based on videos with a combination of skippable and non-skippable ads in 20, 30, and 60 second formats.